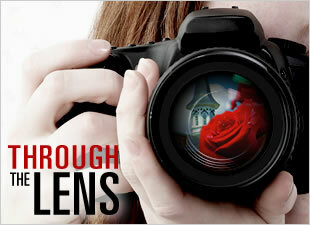 We have another guest blogger here at Through the Lens. John Gilmore is going to keep us updated on racing superstar Goldikova. 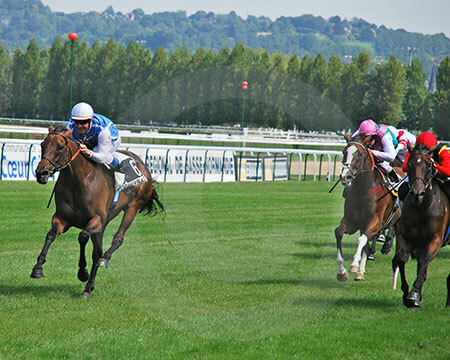 A journalist and horse racing photographer based in France, John Gilmore attends major race meetings in the Parisian area and in Deauville during the summer. John looks forward to sharing his observations and images with us as he follows the great mare. Goldikova’s training plan includes a return to Churchill Downs where she will defend her Breeders’ Cup championship. 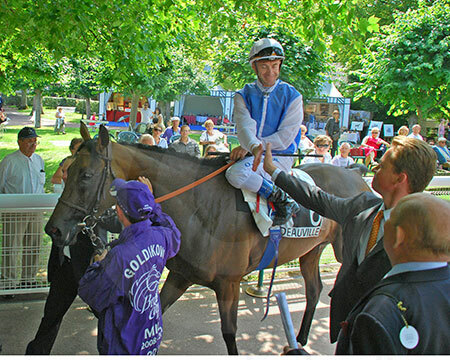 Sensing Deauville was her favourite track and she was the star of the show ready to perform, Goldie entered the parade ring on her toes, ears pricked and looking round as she prepared for the Prix Rothschild on July 31, 2011. When Olivier Peslier mounted Goldie, the mare instantly nodded her head in approval realising it was a friend, though the handler had to straighten her up leading to the track. Excitement for the race was building up.. Once on the track the pair quickly got into an even stride down to the start, passing the stands to loud applause, including from around 100 "Goldie" fans waving banners. Never giving her fans an anxious moment in the race - Goldikova always looked the winner and it's a long time on a French race track since I heard such an applause. This went on for ages after she calmly entered the winners enclosure, hardly blowing at all posing for a picture and probably wondering what all the fuss was about. Trainer Freddie Head and jockey Olivier Peslier were overjoyed, passing a very emotional moment with the journalists, who crowded round listening intently to every word they said. The most telling thing Olivier mentioned; “I never had to use the whip and she won as she pleased,” while Freddie Head planned the same programme as last year with all roads leading to the Breeders’ Cup. Goldie truly is a racing legend in our time. Thanks for visiting www.ThroughTheLensBlog.com and thank you to Anne Eberhardt for letting me join in on the fun. If you’d like to see images of Goldikova training and at the barn with her lads let us know! We would also like to hear which race of Goldikova's was your favorite? Read the full BloodHorse.com story on the Prix Rothschild. View more Goldikova photos at The Blood-Horse Photo Store.